The typical construction of fire performance tools involves a metallic structure with wicking material made from fibreglass, cotton, or Kevlar blended with fibreglass, Nomex, and other poly-aramids. Kevlar-blend wicks are the most common, and are considered standard equipment in modern fire performance. Though most wick suppliers refer to their wick simply as Kevlar, almost no suppliers sell a 100% Kevlar wick, which is both expensive and not particularly absorbent. Most serious contemporary performers avoid cotton and other natural materials because such wicks disintegrate after relatively few uses, and can come apart during use, showering the performer and audience with flaming debris. 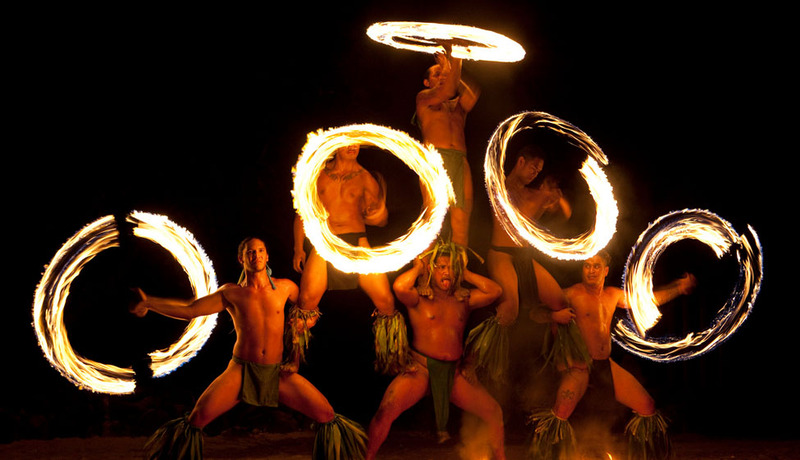 A typical poi construction would consist of a single or double-looped handle made of webbing, Kevlar fabric, or leather. This is connected to a swivel and a length of chain or cable. This chain or cable then connects to another swivel, and then to the wick, which is made out of tape wick (a wide, flat webbing made of wick material), or rope wick. The wick material is typically folded or tied to a central core in either a knot or lanyard-type fold. The chain or cable can be anything from stainless steel wire rope (preferred by some for its low cost, light weight, high strength, and almost invisible profile, but not by others because it tangles easily) to dog chain (preferred by some for its heft and low cost) to industrial ball chain, which is the most common chain for fire performance equipment. Made of nickel-plated steel, stainless steel, or black-oxide brass, ball chain in the #13 to #20 size ranges provides excellent strength, a fluid feel, and great tangle prevention. Since every link on the chain swivels, one can eliminate dedicated swivels from a design, and body wrapping and chain wrapping moves become much easier. Extra cost and a higher weight to durability ratio are the biggest downsides to ball chain. A fire staff typically consists of a long cylindrical section of either aluminium tube (lighter, more suitable for fast-spinning tricks) or wood (heavier, more suited to 'contact' moves in which the staff retains contact with the performer throughout the trick; see contact juggling) with a length of wick secured at either end, usually with screws. Wooden-cored staves often have thin sheet metal wrapped around the ends to prevent charring of the wood from the heat - this will have holes drilled through it to allow the wick to be screwed securely into the core. Metal staves generally have a length of wooden dowel inserted into each end; holes are drilled through the metal to allow the wicks' screws to gain firm purchase on the wooden core. A grip of some sort is usually fashioned in the centre of the staff to provide a comfortable hand-hold - most commonly leather, or a soft, self-adhesive grip of a type designed for hockey sticks or tennis rackets. Building high quality fire performance equipment involves the balancing of a number of factors to achieve performance suited for the specific intended use by the performer. Even if you are planning on buying prefabricated equipment, understanding the following factors and how they interrelate will allow you to best purchase the right implement. * Balance - Balance is how the weight is distributed in the implement. It is critical when making staffs, torches, hula hoops, clubs and swords, as balance will determine the axis around which the implement rotates. * Weight - Making implements heavier will, up to a certain point, allow you to spin them faster. However weight will also make the implement increasingly unwieldy. Also, heavy implements are more likely to lead to repetitive stress disorder, and cause injuries if you make mistakes. Heavier implements make certain types of contact juggling much easier, and certain high speed manipulation more difficult. * Wick size - Generally, the more exposed surface area of wick on the prop, the larger the flame. More wick will increase the fuel the implement will hold and if wick is layered increase burn time. The prop will also be heavier, and more expensive to construct. The more fuel the prop holds the larger the increase in weight after fuelling. * Cost - The fourth factor is cost. Frequently new prop development, and sometimes even building standard designs, require extra materials and tools that are not readily available. Even dedicated home tinkerers find themselves weighing the cost of purchasing versus the cost and time of build at home.